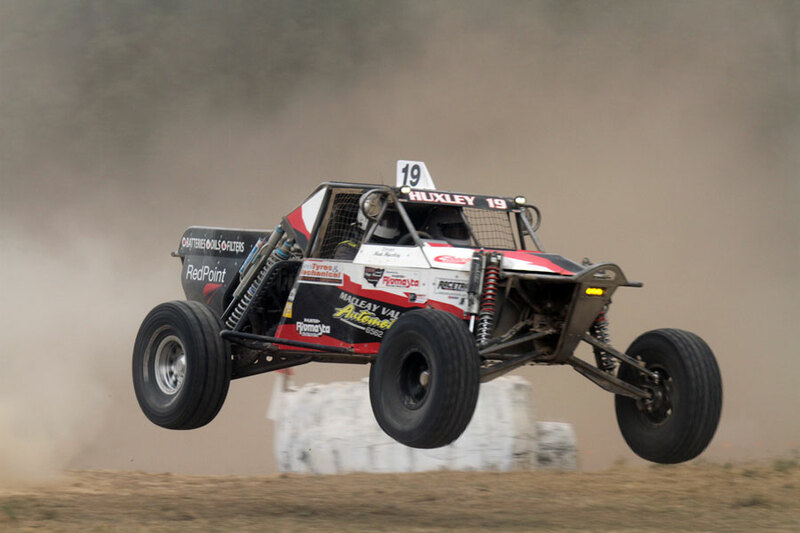 Local hard charger Mathew Huxley and navigator Derek Seam #19 have piloted their Chev V8 powered Thornbuilt Wasp into the outright lead at the completion of a dusty day one of the Kempsey 250. Huxley and Seam began todays 4-lap section out of position three, and that is where they finished on track, though were able to sneak home through the dust to forge a 12 second time advantage over prologue victors Peter and Marda Carr #698. Carr claimed this mornings prologue by four seconds, though was pipped by fellow SXS Turbo Can Am competitors Phil Lovett and Paul Gunther #697 in the Dallas’s Top 10 shootout. 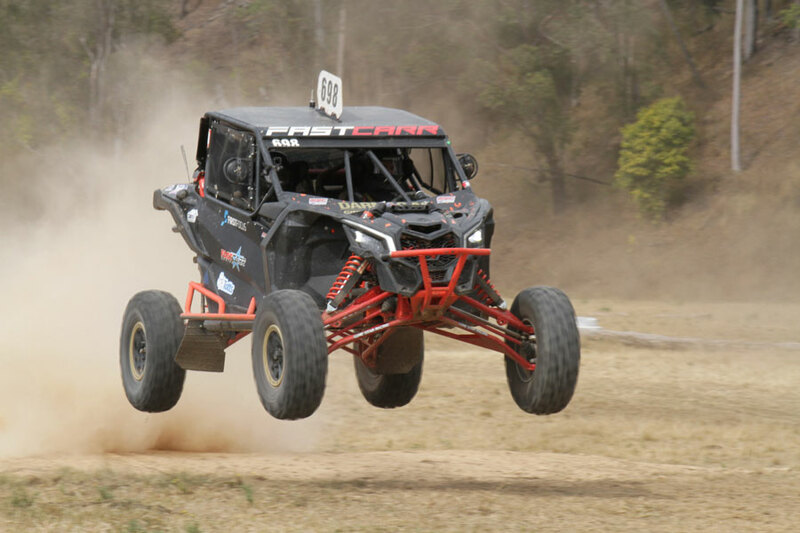 Carr, who won the opening round of the Hunter Rivmasta NSW Offroad Championship at Colo Park managed second outright at day’s end, 2 seconds clear of Lovett in third. Glen Towers and Josh Harris #80 have blasted their Nissan V8 Brenthel beast into fourth outright, a terrific drive from the regular front-runners after starting out of 11th after an issue in the prologue. Superlite B competitors Jay Neate & James Milligan #644 rounded out the top five in their Can Am Maverick X3. The local crew of Tim Baker & Craig Anderson #69 finished in 6th. 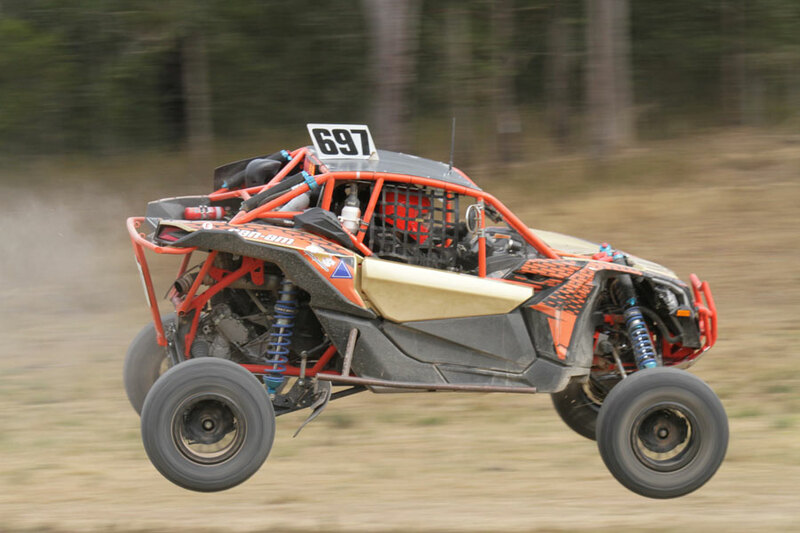 Four time NSW Offroad Champion Derek Rose and navigators Kym Aitken/ Tim Baxter #62 brought their newly acquired pro buggy home in 7th, three seconds clear of locals David and Michael Spokes #46 in 8th, Ben Scott and Jamie Scott #76 in 9th. Justin Chisholm and Irene Keramidas #6628 were the first of the SXS Sport crew’s home in 10th outright. In the class battles, Richard and Terese Wilton #206 hold a slender 18-second lead in the Super 1650 class over their nearest rivals Scott Brown and Tony Burgess #211, with both looking to add to their championship tallies. Tim Battle #358 leads the way in the Sportsman class; Derrin Hedges #462 in the Extreme 2WD class, Anthony Abson #1026 in the Sportslite and Winston Parr #727 in Production 4WD find themselves in their respective class leads. Big outs from day one include multiple time Kempsey winners Chris and Len Levi #210 with engine failure in the prologue, other to bow out to engine dramas included Drew Corcoran #777, Austin Atkinson #272 and Bruce Morgan #761. David Chandler #97 found himself well entrenched in the top 10 until losing a front wheel, Gerard Bawden #78 electrical issues, Scott Davis #77 CV failure, Darren Perrin #256 front end, Steven Harris #98 gearbox, Luke Kenyon #494 and Edward Mackney #1080 all failed to finish Saturday’s racing. 28 of the crews completed full race distance on the opening day, with the 12 laps of racing to get underway at 9.30am tomorrow!